I’m excited to welcome Tina Connolly today! She’s the author of a whole pile of awesome novels from Tor and Tor Teen, plus a short story collection from Fairwood Press (that I happened to blurb). 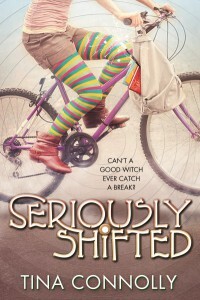 Her latest is the second book in her funny and fun YA series about a teenage girl, witchcraft, and all sorts of mayhem. 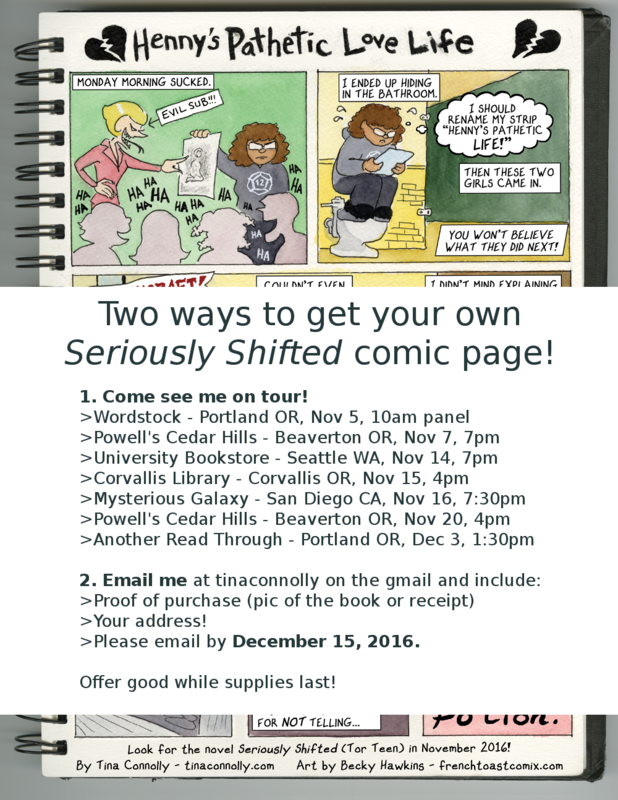 Tina is kicking off a book tour and has an especially nifty incentive for buying her book: a one-page comic! One of the most fun things about the Seriously Wicked series has been getting to collaborate with other artists. The series overall is about a girl who’s stuck living with a seriously wicked witch. But she also has to keep up her grades and pass Algebra and deal with everyday 10th grade problems, as well! In the first book, Seriously Wicked, Cam falls for a cute boy-band boy who plays guitar. He writes a song about her, “Lion Tamer”, which is written out in the book. So when Seriously Wicked was released, I thought it would be really fun to have this song available to hear. I got my good friend Spencer Ellsworth to record the song and you can hear his awesome work on Soundcloud—lion roars and all. In book two, Seriously Shifted, I knew I wanted to include another artistic character in the series. Enter slightly geeky Henny Santiago-Smith, who writes an online comic called Henny’s Pathetic Love Life. Poor Henny gets caught up in witchy things when one of the new wicked witch characters decides to make Henny’s life an absolute disaster. Henny flees to the girls’ bathroom, where she encounters Cam secretly working a spell. In the book, this scene is of course from Cam’s point of view. But I thought it would be great fun to see how this scene looked from Henny’s point of view, as if she were writing it up (as she keeps threatening to do) for one of her online comics. I contacted another friend of mine—amazing cartoonist Becky Hawkins—about developing a piece that would illustrate this scene. Becky writes a delightful comic called French Toast Comix, and it has a really playful, fun style that I could see fitting the work of an (obviously super-talented!) teen. 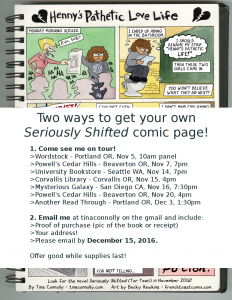 Becky came up with a one-page comic for me that is just fantastic, and I decided to use it as a giveaway on my upcoming book tour stops for Seriously Shifted. So come see me at one of those and you can collect your very own comic page that goes along with the book! Many thanks to Beth for having me on the blog, and I’m delighted to see Seriously Shifted out in the wild at last!